What are Restless Leg Syndrome and Periodic Limb Movement? What causes RLS and PLM? How are RLS and PLM usually treated? How has LegCalm helped others? How do I use LegCalm? Restless Leg Syndrome (RLS) is a common condition which causes pain and discomfort and prevents healthy sleeping patterns in sufferers. If you often feel an urge to move your legs when sitting or lying still for a long time, experience a “funny”, uncomfortable, creepy or itchy sensation in your legs when at rest or have ever woken yourself or your partner up during the night with jerking movements of your legs you may very well have Restless Leg Syndrome or RLS. These symptoms are usually most troublesome at night though they can also occur during long stretches of inactivity, such as car trips, airline travel, in meetings, or when watching movies. Voluntarily moving the legs usually brings temporary relief from the unpleasant sensations. RLS is often detrimental to normal sleeping patterns, leading to insomnia and subsequent fatigue during the day - a problem that is inconvenient and debilitating for many people. Restless leg syndrome often has an insidious onset and worsens slowly over time. As the condition deteriorates the arms may also become involved. Periodic Limb Movement of Sleep (PLMS or PLM) is a similar condition, but occurs during sleep. People suffering from PLM are not always aware of their problem although it does sometimes wake them up. Often the problem is reported by their sleeping partner who is kept awake by the involuntary movements during sleep. While not all people with RLS experience PLM, many people will have both conditions, although RLS remains the most troublesome to the sufferer. Although a single cause for Restless Leg Syndrome and Periodic Limb Movement has not been identified, these sleep disorders have been associated with several other conditions including pregnancy, obesity, neurological conditions, diabetes, ADHD, nutritional deficiency and kidney disease. People with these conditions are far more prone to RLS and PLM, though the symptoms often resolve when the underlying condition is properly treated or comes to a natural end. Deficiencies of minerals, notably magnesium deficiency and iron deficiency anemia are also implicated in causing RLS and PLM. Environmental and other toxins including alcohol, cigarette smoke, caffeine and certain drugs like antihistamines, anti-nausea drugs, blood pressure medications and certain prescription antidepressants can also cause or worsen symptoms. Because these conditions sometime run in families, researchers are currently investigating a genetic link as well. If there is a known underlying condition causing RLS or PLM, treatment will be based on correcting the underlying disease. If no causative condition is known there are several drugs currently used to treat the symptoms of RLS and these are generally sedatives, anti-convulsants, pain-killers or dopaminergic drugs. All of these prescription drugs have the potential to cause adverse side-effects and some are also addictive. For this reason, people who suffer from PLM without RLS are often advised against medication due to the fact that PLM causes fewer problems and less sleep disturbance than RLS. A diet rich in fresh fruit and vegetables with protein derived mainly from white meat like fish and chicken is a heart friendly diet that will help to support healthy and efficient circulation throughout the body, including the legs. If you feel restless for fast food, high in fat, sugar, salt and synthetic ingredients, spare a thought for your heart before you give in! Drink plenty of water and avoid caffeinated drinks, alcohol and cigarettes. Putting your legs up now and then to relax is not a bad thing, but make sure to include regular exercise every day – even if it is just walking that extra block to work or taking the stairs instead of the elevator. Your legs will thank you for it if you rest less and walk more. Natural remedies can also be of great benefit in supporting healthy limbs and cardiovascular functioning without the risk of side effects or addiction. 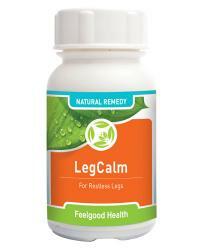 LegCalm is a 100% safe and effective natural remedy for treating Restless Leg Syndrome and Periodic Limb Movement. Presented in convenient capsule form, LegCalm contains a selected combination of herbal and homeopathic ingredients working together in synergistic fashion to relieve and prevent the symptoms of RLS and PLM. Regular use can help to support the nervous system and relieve the symptoms of these troublesome sleep disorders as well as address the underlying causes. "This has helped me get a good nights sleep..."
Astragalus membranaceous is a well-known revitalizing herb used for centuries in traditional Chinese Medicine. Astragalus balances and improves functioning of all the body’s organ systems through its adaptogenic and tonic properties. This herb also boosts circulation and assists absorption of iron from food- important for sufferers of RLS as iron-deficiency anemia has been implicated in this condition. Ruscus acluteatus is also known as Butcher’s Broom and is used extensively in Europe to improve circulation and relieve the pain and discomfort associated with restless leg syndrome. Also useful in treatment of constipation and water retention, circulatory disorders including hemorrhoids and varicose veins and as a bladder and kidney tonic. Aesculus hippocastum (Horse Chestnut) helps promote healthy blood circulation throughout the body, including the legs and can relieve Periodic Limb Movement and RLS by keeping the blood flowing smoothly even during rest and sleep. Rhus tox (30c) is a homeopathic remedy for restless leg syndrome and is very effective in relieving the overwhelming desire to constantly move, change position or even get up and walk around at night. Rhus tox. is also useful for treating stiffness, snoring and night-time anxiety. Zinc met (30C) is another homeopathic treatment for RLS and is used effectively for improving immune system functioning and aiding absorption of minerals to prevent deficiencies. Zinc met.also acts as a calming and psychologically soothing ingredient for people whose anxiety and excess energy manifest as periodic limb movement and night-time restlessness. Mag phos (6C) is one of the 12 Biochemic Tissue Salts and is very useful in the treatment of spasms, muscle contractions and twitching and is an excellent aid in preventing involuntary limb movement. Mag. phos. also addresses deficiency of Magnesium which is known to be associated with Restless Leg Syndrome and Periodic Limb Movement. LegCalm comes in a bottle of 60 100% gelatin-free, vege-capsules. Directions: Take two capsules three times daily for 10 - 14 days. Thereafter take one capsule two to three times daily to prevent a recurrence of the condition. Caution: Please consult your medical practitioner should symptoms persist. Safety during pregnancy and nursing is not yet established. In stubborn cases, treatment may have to be continued for a few weeks before significant improvement is noticed. However, most people will see results within the first few days of taking LegCalm. One bottle of 60 LegCalm capsules will last between 10 days and one month depending on the stage of treatment and dosage required. It seems like my child can never sit still. Is it possible that he/she has RLS? RLS can affect people of any age, including children. At certain ages though, children may just be energetic and this does not necessarily indicate RLS. Interestingly, there is a growing body of evidence linking ADHD and RLS in children. Restless Leg Syndrome does often seem to run in families and, although there is currently no evidence that it is hereditary, a genetic component of this condition is currently being researched. It is not known exactly how many people are affected by RLS though several studies have been done on the prevalence of RLS in adults in the US and the general consensus thus far is that about 10% of people experience RLS symptoms at some time or another. Is it possible to have RLS in areas other than the legs? Yes, RLS can affect the arms or even the trunk. Can I use LegCalm along with my prescription medication? LegCalm has a high safety profile and is generally safe to use along with most prescription medication. If in doubt, please consult your health care practitioner or make use of our free Ask Us Service. Eat a balanced and wholesome diet to prevent dietary deficiencies as well as keep your body in peak health. Especially include food high in iron (liver, eggs, raisins, green leafy vegetables) and magnesium (whole grains, nuts, beans, dark green leafy vegetables, shellfish). Speak to your doctor about taking iron and magnesium supplements. If taking magnesium supplements, it is advisable to include a calcium supplement as imbalances in the amounts of these two minerals can reduce their effectiveness. Exercise regularly to induce better sleep at night and improve circulation. Cut out all caffeine-containing food and beverages from your diet. Speak to your doctor about changing or reducing the dosage of prescription medications that may be contributing to your RLS or PLM. Before bed-time, try stretching and having a cool bath to induce sleep and prevent restlessness. Avoid synthetic fabrics and try to only wear pyjamas in natural fibers to prevent aggravation of RLS. Sleep Softly: Remedy to stop restless legs plus long term insomnia support!